• Used alone, the user simply pushes on the FingerSim™ to generate a "pulse". Or, use with the SPO-2000 to add a calibrated pulse rate! • Formerly made by Nonin Medical - Finger Phantom. 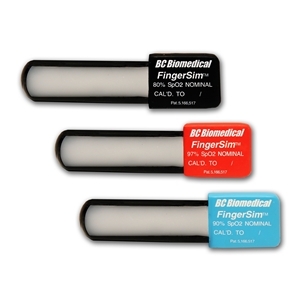 • The FingerSim™ Replacement Set comes with the FingerSims™ only. • Easily add Calibrated pulse rates with the optional BC Biomedical SPO-2000 Pulse Oximtery Simulator or add Pulse Oximetry testing capabilities to the BC Biomedical NIBP, PS-2200 & PS-2100 with the purchase of the BC Biomedical MSP-2100 Pulse Oximetry Module. PLEASE NOTE: FingerSims™ are guaranteed for a shelf life of 12 months, these units are NOT able to be recalibrated. Simply order a FingerSim™ Replacement Set at the end of the one year replacement cycle.